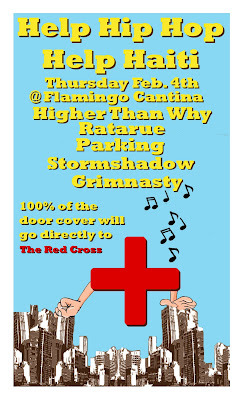 From the hope department... Help Hip Hop Help Haiti @ Flamingo Cantina tomorrow, Feb 4th! Check out Higher Than Why, Ratarue, Parking, Stormshadow and Grimnasty! 100% of the cover goes directly to The Red Cross! Austin Hip-Hop Scene iPhone App Released!